Hannah Höch, Rohrfeder Collage (Reed Pen Collage), 1922, paper, 11 × 9”. Grotesque portraits of men with animal bodies, images constructed around a red mouth, dancing bees that hover in the sky: Hannah Höch’s works are layerings of body and object that often interweave sociopolitical themes with a punk aesthetic. This extensive exhibition spans six decades of Höch’s production, from 1910 to 1970. It consists primarily of studies for her collages, photomontages, and decals in scrapbooks. Beginning with her collages from the postwar era, which satirize figures in politics and economics (Staatshäupter [Heads of State], 1918–20), it then crosses over into a visual treatment of gender politics and structures of dominance. Der vater (The Father), 1920, exhibits figures assembled from fashion magazines and illustrated journals torn out of their editorial context, calling into question the originally homogenous—and therefore conventional—representation of the body or a singular, coherent identity. 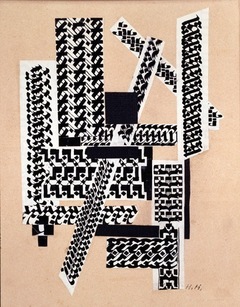 The collage medium almost evinces a contemporary engagement with materiality and a reconnection to textiles, such that works including Rohfelder collage (Reed Pen Collage), 1922, seem to be almost like embroideries. The fascinating series “Aus der sammlung: Aus einem ethnographischen museum” (From the Collection: From an Ethnographic Museum), 1929–30, is comprised of montages mounted on single blocks of color. Here, bodies and artifacts are represented in the style of the 1920s avant-garde, while, once again, stereotypical understandings of gender are dismissed. The putative understanding of beauty is taken up in later collages, such as Am nil II (On the Nile II), 1940, which are allegorically interwoven with ancient Egyptian motifs and organic forms. These often complex layers coalesce in the latest and the biggest collage in the exhibition, Lebensbild (Life Portrait/Image of Life), 1972/73, an image of Höch’s own constantly shifting identity, pieced together with self-portraits from different periods of her life and photos of her cacti, house pets, and lovers, as well as photographic reproductions of earlier works. Lebensbild is a chronicle of the artist’s life and long artistic production, closing the exhibition perfectly.